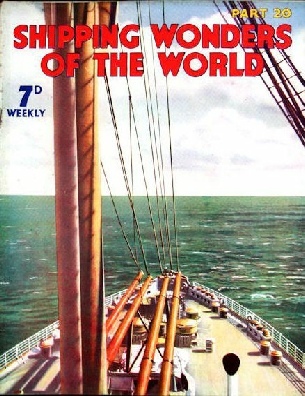 Part 20 of Shipping Wonders of the World was published on Tuesday 23rd June 1936. 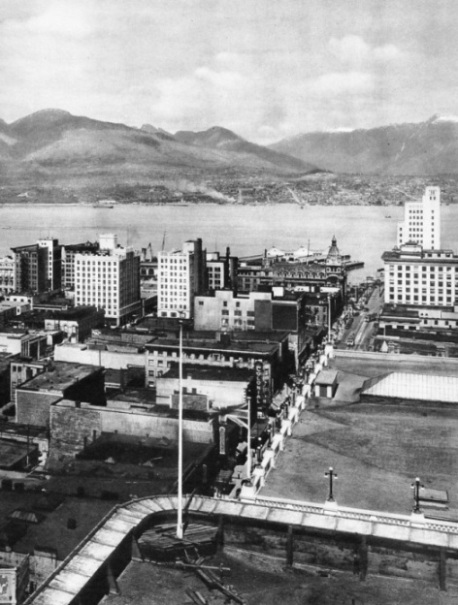 It included a centre photogravure supplement featuring the port of Vancouver, which formed part of the article on The Romance of Vancouver. This week’s cover is a study taken from the deck of the Bremen on one of her voyages to New York. This peaceful scene forms a striking contrast to the stormy picture, also taken from the Bremen, published on the cover of part 6. The Bremen, built in 1929, has a gross tonnage of 51,656.
part 6, part 11, and part 23. 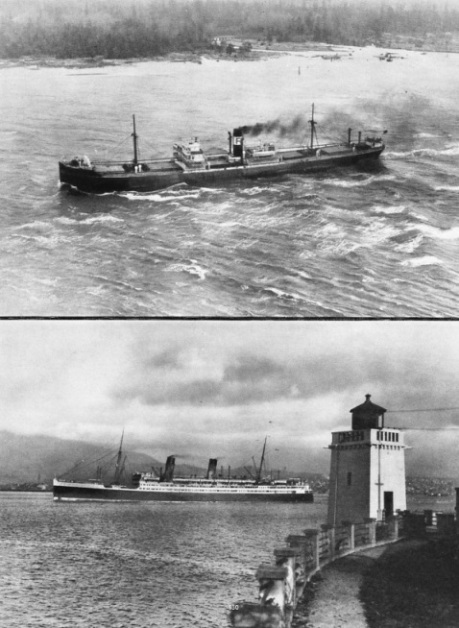 The lower photograph shows the Canadian Australasian liner Aorangi passing Brockton Point Lighthouse at the beginning of her voyage to Australia. This lighthouse is situated at the eastern entrance to Lions’ Gate. Its fixed red and white lights are visible for a distance of five miles across the harbour. The lighthouse is equipped also with a fog bell which sounds every five seconds when necessary. The cruisers of the Royal Navy patrol the trade routes of the British Empire, and guarantee the protection of merchant vessels in every ocean. The modern cruiser is the lineal descent of the old-time frigate and performs exactly the same functions in peace and war as its predecessor of Nelson’s day. Cruisers in the modern British Fleet range from 10,000 tons to 4,200 tons displacement, with armaments varying from eight 8-in 256 pounders to five 6-in 100 pounders. This chapter is by Hector C Bywater and is the sixth article in the series The Navy Goes to Work. First planned by James Watt in 1773 and opened to shipping in 1822, the Caledonian Canal is chiefly used to-day by fishing vessels and tourist steamers. The canal is sixty miles long and extends from the Moray Firth on the east coast of Scotland to Loch Linnhe on the east coast. This chapter is written by C Hamilton Ellis and is the seventh article in the series on World Waterways. (Left) DRYING THE SAILS of the Ahto I alongside a jetty after a wet passage. The sails, on which so much depends, must be stored dry to prevent the formation of mildew. In comparison with the length of the yacht and her low freeboard, the mast is exceptionally high. Ahto Walter prefers to carry extra sail to give the vessel a faster speed when more orthodox yachtsmen would reef. Ahto’s and Olsen’s memoirs of their voyages were published in 1935 under the title Racing The Seas. Italy’s contribution to the world’s mercantile marine in the last few years has been characterized by the production of a number of fast passenger liners with luxury accommodation. Two of the most important of these, the Rex and the Conte Di Savoia, were designed to capture transatlantic speed records. The Rex was built by the Ansaldo works at Sestri Ponente, in the Gulf of Genoa, and the Conte Di Savoia by the United Adriatic shipyards at Trieste, at the head of the Adriatic. This is the fifteenth article in the series on Merchant Ship Types. The Rex is also shown on the cover of part 33. Formerly an association of underwriters and brokers who met in a London coffee-house, Lloyd’s is now a corporation dealing with insurance in all its branches, and particularly with marine insurance. Before 1871 Lloyd’s was merely an association of underwriters and brokers, but in that year it was incorporated by an Act of Parliament, and statutory duties were subsequently laid upon it. In 1734 Lloyd’s List appeared, and in 1836 the rival Shipping Gazette. The two papers, after long association, were amalgamated in 1916, as Lloyd’s List and Shipping Gazette. Lloyd’s Register of Shipping is the leading society for the classification of ships. This chapter is by F A Bex. In the face of almost universal opposition Christopher Columbus and his small expedition set out across the unknown waters of the Atlantic Ocean in search of a new route to the continent of Asia. Columbus was the only early navigator or explorer who altered the whole course of history by the achievements of a single voyage. Columbus discovered the New World, the great American continent, and gave new life to the Old World. This chapter is by Sidney Howard and is the third article in the series Supreme Feats of Navigation. The article is concluded in part 21. 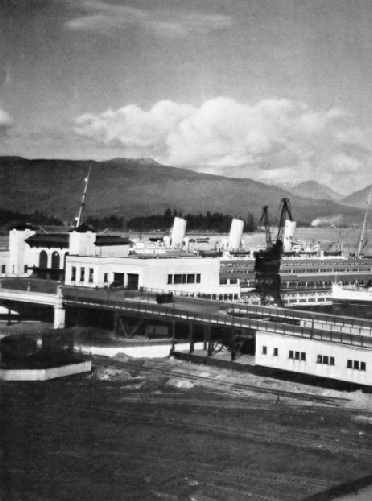 THE OCEAN DOCKS of the Canadian Pacific at Vancouver. In the foreground is the Canadian Australasian liner Aorangi, 17,491 tons gross. This magnificent quadruple-screw liner was built at Glasgow in 1924 and is registered in London. She has a length of 580 feet, a beam of 72 ft 2 in and a depth of 43 ft 5 in. 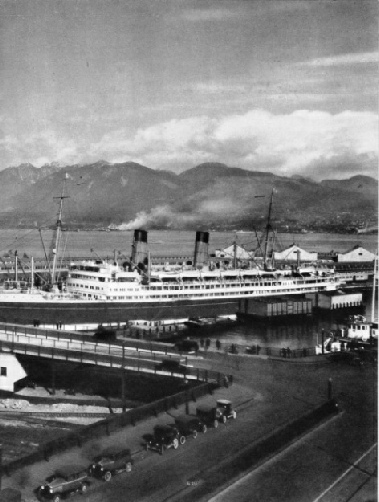 Pier B-C is reserved by the Canadian Pacific for the use of its liners on the service to the Far East. The Empress of Asia, the Empress of Canada, the Empress of Japan and the Empress of Russia are regularly employed on this service. The pier was opened on July 4, 1927, and cost approximately five million dollars, or over £1,000,000. The great land-locked harbour of Vancouver forms Canada’s gateway to the Pacific Ocean. In the lifetime of one man Vancouver has grown from an insignificant log-camp into a modern commercial centre. Vancouver is the commercial metropolis of the Province of British Columbia and the third largest city in the Dominion of Canada. This chapter is by Sidney Howard and is the sixth article in the series Great Ports of the World. THE LAND-LOCKED HARBOUR of Vancouver is set in surroundings of magnificent natural beauty, as befits the great Pacific port of the Dominion of Canada. Across the waters of Burrard Inlet snow-capped mountain peaks dominate the industrial scene. Three passenger and freight ferries link the two shores of the port in this central section of Vancouver Harbour. Only fifty years before this photograph was taken these shores were almost uninhabited.